For weeks we have been counting the days until the official start of Spring. And, today is the day! Spring is a time of fresh new beginnings. Baby animals and birds are being born. Plants poke their heads up through the ground after a long Winter’s nap. They shed their warm coats, opening up their buds to unfurl leaves and blossom into delights for our senses. For the Christian faith, Easter eggs symbolize the empty tomb of Jesus, reminding them that He rose from the grave and those that believe will also experience eternal life. Eggs are a symbol of new life and a new beginning, no matter what your faith. The stores are filled with eggs of every color, pattern and type. A favorite is the plastic egg. For years I would buy dozens of the colorful plastic Easter eggs after the holiday to provide supplies for the many activities you can do with them. A favorite plastic egg activity at our house was making cardboard tube rockets. Half of an egg was the nose on the rocket. This activity took months to perfect by my second grader, so it will not be introduced today. Below you will find many other fun, educational, quick, easy activities for you to create with plastic eggs that will help you interact with your child. Remember safety is always a priority! Adapt activities to your child(ren)s age and stage of development. Fill a container with a sensory material of your choice. Container ideas: plastic dish pan, cooking pot or deep pan, large plastic storage container, wheelbarrow, bucket, etc. Sensory Material ideas: sand, packing peanuts, rice, beans, etc. Hide the eggs and then let your toddler/preschool child go on an egg hunt. Fill eggs with messages. 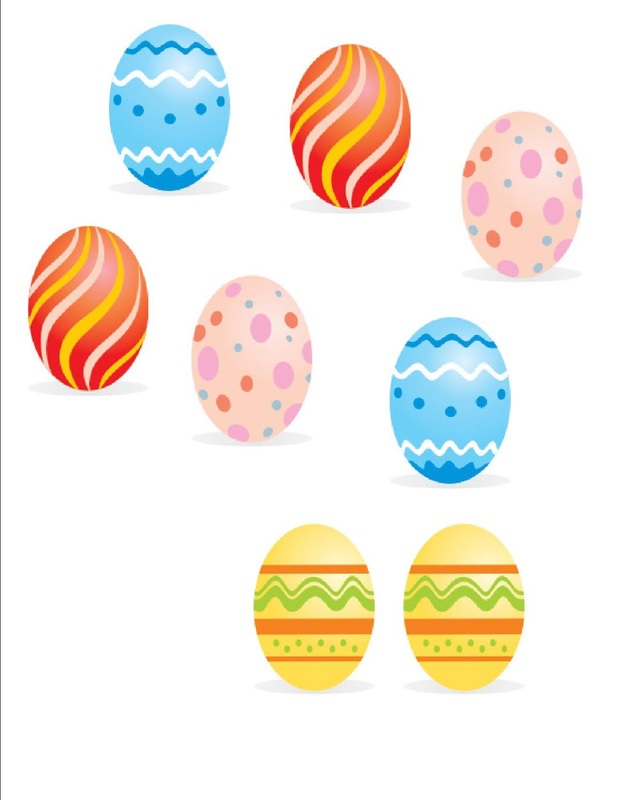 Hide the eggs under pillows, in the corner of the couch, in a glass or mug, on a dinner plate, inside the dinner napkin, inside a book bag, on the seat of the car, on the desk, in a kitchen or bathroom drawer, etc. Be creative! Think about the places that will be seen each day. Example messages: You are loved. Get creative with your messages and let your loved one know you are thinking about them. Have a basket in the kitchen or living room to collect the eggs at the end of the day. Talk about when the egg was found and how they felt after finding and reading the message. Give everyone in the house a half a dozen eggs to fill with messages. Let each person hide their message eggs where ever they want. Talk about the egg hunt at the end of each day. If you want add a treat too! Buy a dozen different color eggs for each child. You can color code them if you want. 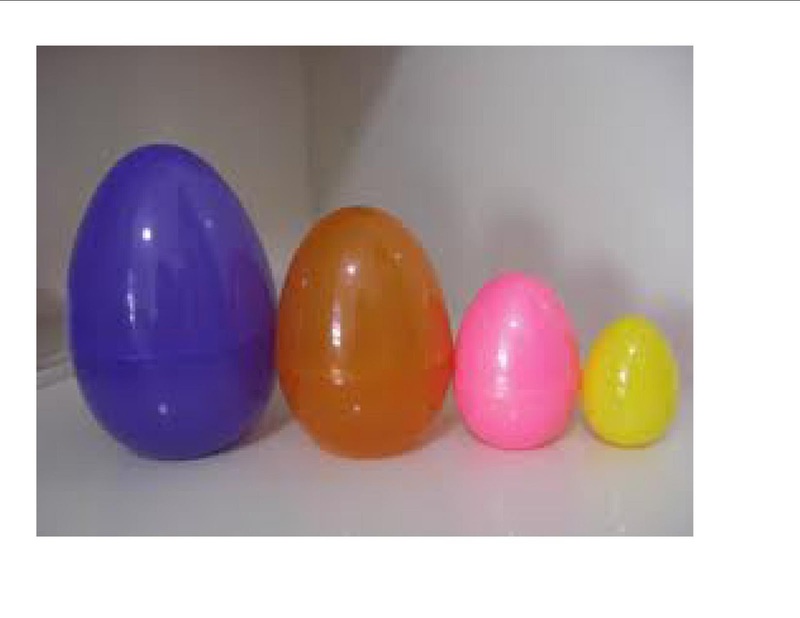 Example: Susie gets pink eggs, Joey gets green, Henry has orange eggs and so on. Place a redeemable coupon inside each egg. Make your own coupons (hand written or designed on the computer). Coupon ideas: one bear hug from Mom, Dad, etc. a story read to you by Mom, Dad, etc. 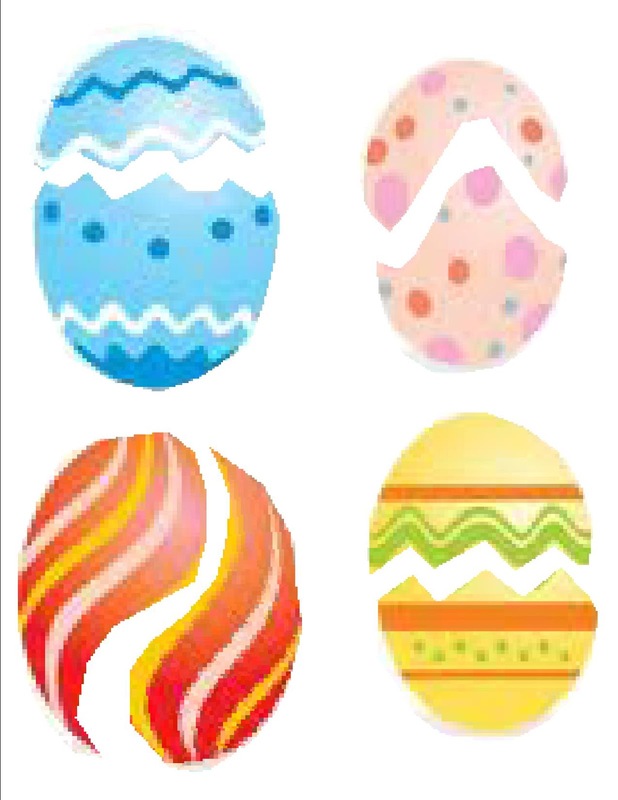 As you conduct your annual Easter egg hunt include these coupon eggs. The kids will be eggcited! It will add a twist to the annual tradition and continue to provide family interaction and fun for weeks to come. 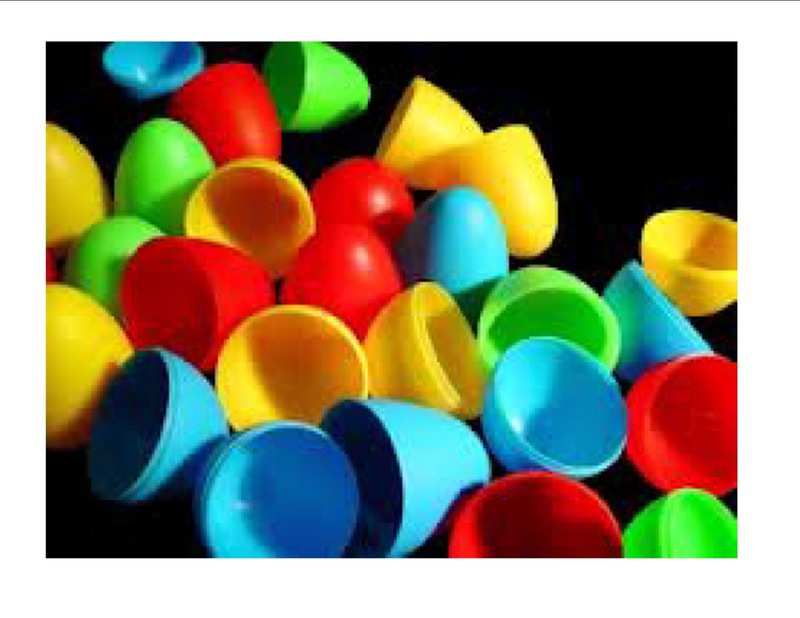 Place one small toy or item in several eggs then put them in a basket or empty egg carton. Choose an egg, discover the item inside and then create a story about that item. One person can make up the story or you can take turns adding to the story one sentence at a time. You will be amazed at the twists and turns and unexpected plots that will be hatched. Or, use these eggs as a memory game. What’s inside or underneath? Use a cookie cutter to create an egg pattern. Cut out eggs from any resource available to you. Examples: left over wall paper, wall paper sample books, construction paper, card stock, empty food boxes, wrapping paper etc. After making the number of eggs you would like, cut each egg into two separate pieces. Do not make the cuts the same. Change the shape and style of the “crack” in the egg. Children will improve their visual skills and have fun putting the cracked eggs back together. Store your game in a creative container. or before you throw away a container from an Easter item. 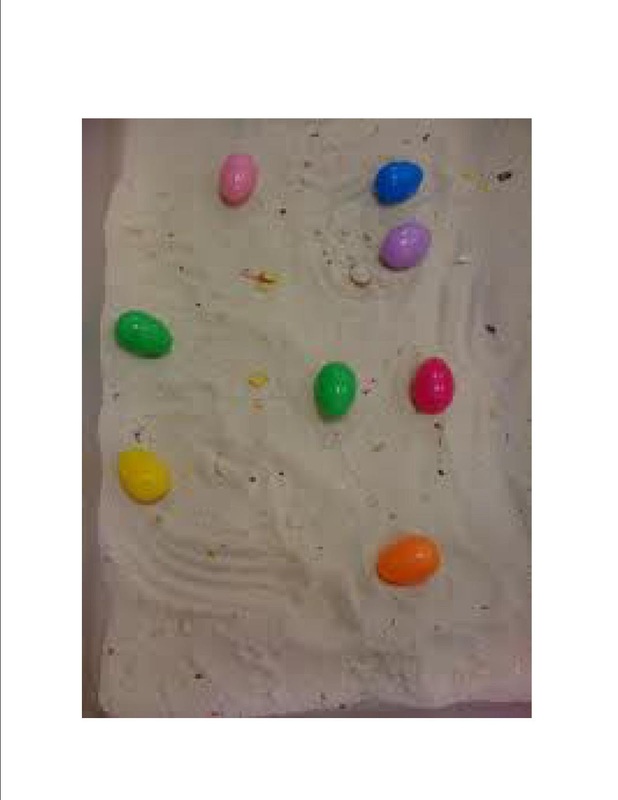 Using the same egg pattern and materials from the activity above, cut out 2 eggs that match. If using wrapping paper or wall paper be sure to match up the pattern each time in the same spot before cutting, to create two eggs that are identical. Smaller children can match pairs, older children can play a lotto game. This will aid in memory and visual discrimination skills. Write the color of the plastic egg on the outside of the egg. Then take turns finding all the orange, or blue, etc. Make baskets of different color eggs. Write the color of the egg on the INSIDE. Children spell the color of their egg and then check inside to see if they spelled the color correctly. You will need an empty egg carton and 12 different color plastic eggs. On the BOTTOM of each egg cup, inside the carton, write one number using a dark colored marker. Start with the number one and end with the number twelve. Label the dozen eggs with one number (1-12) on each of the eggs. 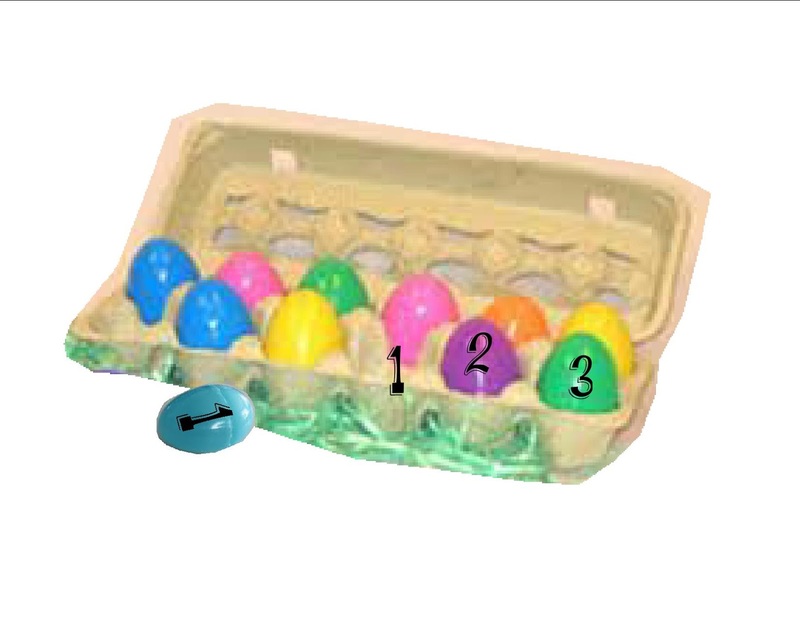 Scatter the eggs around and let children find them, OR fill a basket with the numbered eggs. 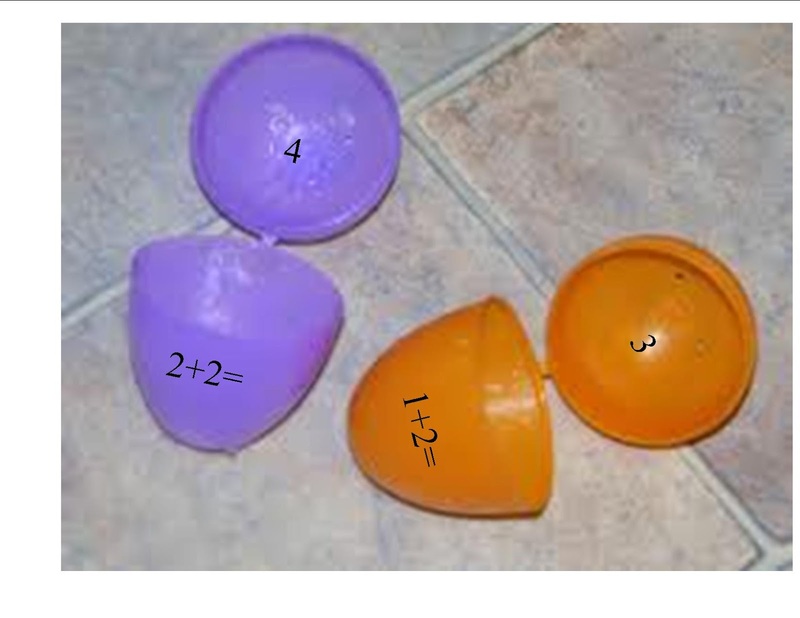 Children then match the number that is written on their egg with the number in the bottom of the egg carton cup until they fill the carton with the dozen eggs. Another idea is to use a dark colored marker to write the same number on the top and the bottom of the egg. Or write a upper case letter on one half and a lower case letter on the other half of the egg. Separate the eggs and let children put the eggs back together. Check to see if they got them right! Make up sets of eggs that fit inside of each other… nest. You can makeup same color sets or sets of different colors. It is fun to see how many sizes you can fit into a set. Using a marker write a lower case letter on the bottom of the egg and an upper case letter on the top of the egg. Take apart all of the eggs and put them into a basket. 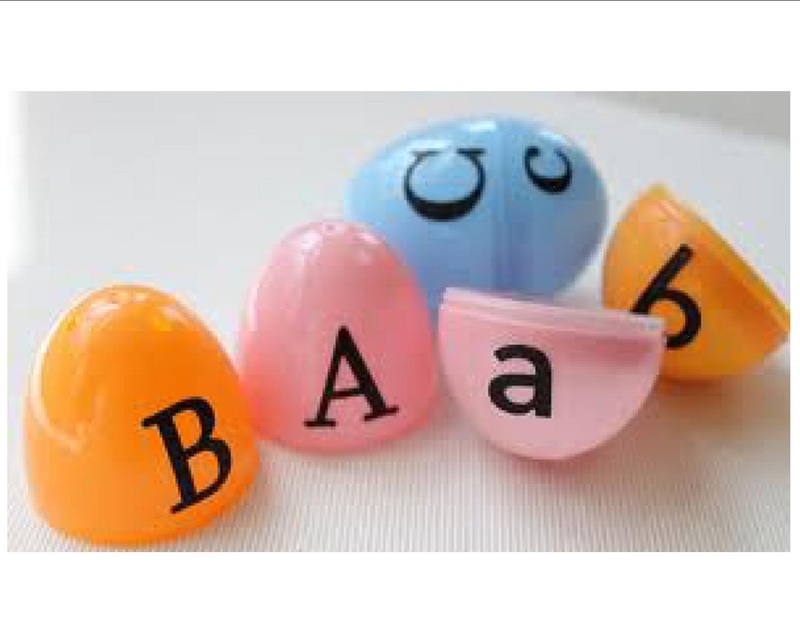 Let children put the eggs back together as they explore the difference between upper and lower case letters. Adults need to check results. Write a row of consants around the top of one half of an egg. On the other half write the last half of a small word. Then experiment with all the different words you can make. Example: “at” can be bat, cat, sat, rat, fat, eat, hat… Children will have fun going through the alphabet to see how many words they can create. Write opposites on each half of the eggs. Separate eggs and then let children put them back together. Sunny/Cloudy Tame/Wild True/False Under/Over Yes/No Water/Ice Useless/Useful etc. Divide compound words writing one half on one side of an egg and the other half of the word on the opposite side of the egg. Children can experiment with different word combinations. 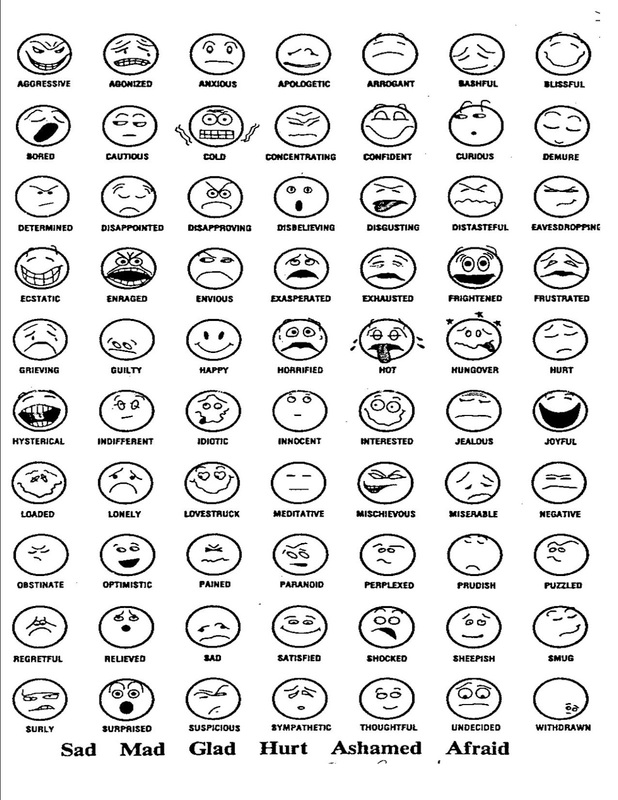 When children are upset or angry they often do not have the verbal resources to label those feelings. This usually results in physical aggression. Draw a picture of an emotion on one side of the egg and write the word to describe that feeling on the other side. Have the children match feelings with the word used to describe that emotion. Equipping children with vocabulary to describe their emotions help them manage their anger in constructive, rather than destructive ways. 1. Using the spelling/vocabulary word list enlarge and make two copies. Cut each word apart. must unscramble the letters to spell one of their words. 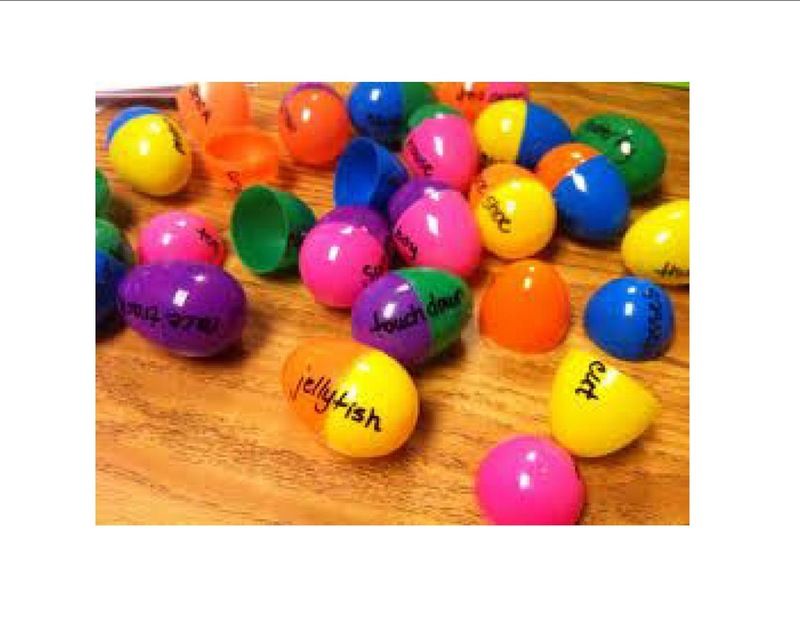 Write a sight word on a slip of paper and insert into an egg. Do this for your child’s entire sight word list. Fill a basket. Then take turns picking an egg and practice reading, then spelling that word. You could also write the words on the outside of the egg, but that would remove the element of surprise and mystery… which equals more fun! Write or type up the what you are trying to memorize. Cut it apart into individual words or phrases. Place one word or phrase in each egg. Mix up the eggs. Then, open each egg, pulling out the individual word/phrase and put it all together. Examples: Bible verse, poem, address, amendments, full name, alphabet, numbers, etc. Write a number on one half of an egg. Draw the appropriate number of dots on the other half. Children count the dots and find the number that matches. Great for number recognition. An alternative for the very small child is to just count a basket of eggs. You can also count all the yellow or blue or green eggs. Separate the colors and then count each pile. Write a simple math equation on the outside of one half of an egg. Write the answer on the other side of the egg, on the outside. Then separate all the eggs and let children put them back together. This is a lot more fun than flashcards. An adult needs to do this with the children to make sure they are getting the problems correct. If not, the pieces go back in the basket and they try again. This is done until all the eggs are put back together. Write the problem on the outside of the egg. Write the answer on the INSIDE of the egg. You could also put beans, pennies, macaroni etc. inside that could be counted to check the correct answer. Example: 2+2= on the outside. Inside the number 4 could be written and there would be 4 beans inside to count. What other plastic egg activities can you create? Wishing you an EGGciting time!